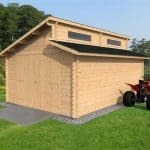 For something large, attractive and functional then this is a high quality, exceptionally good looking outdoor building which doubles up well as a log cabin or a garage for your precious vehicles. 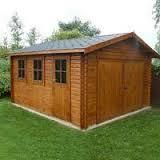 It is attractive and built out of strong 4 way jointed log construction so will last for many years. 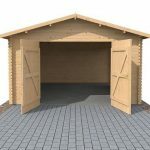 There are large double doors at one end – perfect for getting your cars in and out and a single side door with glass panes as well as two functional windows, so there is plenty of light and air inside. You can use it to potter around with your plants, cultivate seedlings or kick back and relax, whatever your choice, it’s definitely a garden building to be proud of. This product is home delivered.